This is the third instalment in a series on the outlook for Aussie interest rates. Part 1 identified the opposing forces competing for primacy at present: a terms of trade shock due to shifting growth patterns in China and a housing boom that risks destabilising the economy down the track. Hiking interest rates aggressively would hit the housing market on the head. Yet the external shock unfolding, combined with the impending decline in mining investment activity, means that lifting interest rates would be ruinous for the economy, akin to flooding the valley to extinguish a house fire (or bull market, as it were). Unsurprisingly, the RBA has been averse to such a move. 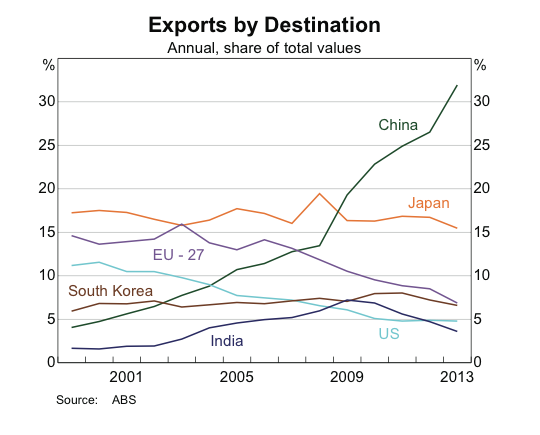 As even the most insular Australians are surely aware, China plays an outsize role in our economic fortunes. Examining how and why this came to pass is vital for understanding the future direction and composition of the Chinese economy, and what this means for Australia. China initiated limited economic reforms in the late 1970s, and since then growth in output has averaged close to 10% a year. There are few historical precedents for such a sustained period of rapid growth; certainly the sheer size of China, with 20% of the world’s inhabitants, means that the global impact of China’s rise has been without equal. The following chart illustrates this shift in relative economic clout. For those who prefer a longer timeline, there’s this from Angus Maddison (by way of The Economist), which shows China’s long march back to global preponderance. The domestic impact in China has been just as momentous, with around 500 million Chinese lifted out of severe poverty since the reform process began. This achievement is simply without parallel in world history. 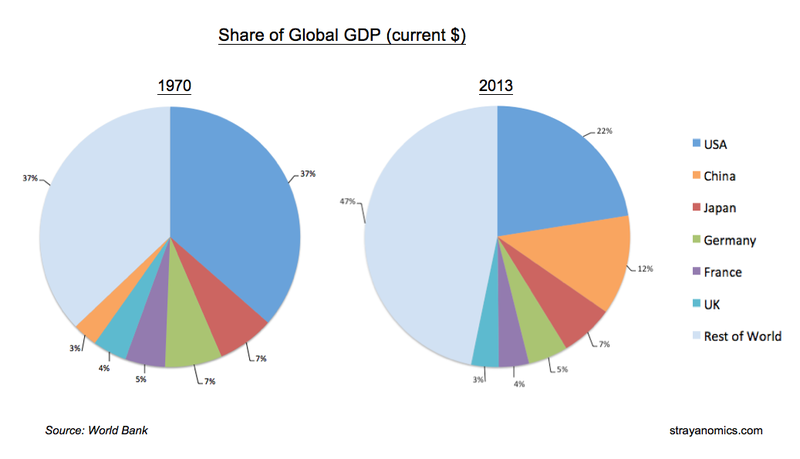 China’s growth was quick but erratic during the first couple of decades of liberalisation. However, since the Asian Financial Crisis (1997-1998) China has grown with remarkable consistency. This period of stable growth, in combination with abundant global liquidity, had a huge impact on the economic performances of developing nations. Ruchir Sharma notes in Breakout Nations, “Between 2003 and 2007, the average GDP growth rate in these (developing) countries almost doubled, from 3.6% in the two prior decades to 7.2%, and almost no developing nation was left behind.” China’s voracious demand for imports of raw materials was an important part of this phenomenon. Since the financial crisis in 2008, and the resulting slowdown in the developed economies of Europe and the US, China has easily been the largest single contributor to global GDP growth. From the seizure of power by the Communist Party (CCP) in 1949 through to beginning of the ‘reform era’ in 1978, China was primarily reliant on the centrally-planned accumulation of physical capital in its attempts to industrialise. Its capital/output ratio was high during this period, and productivity was low, reflecting the inefficiencies of this system (more investment in productive capacity than actual production). International trade was almost non-existent. Partly due to these failed economic policies, China was desperately poor. In the late 1970s its per capita GDP was less than two-thirds of the African average (see Maddison, 2003). After Mao Zedong died in 1976, power within the CCP shifted to reformers, with Deng Xiaoping chief among them. The reform process officially commenced in December 1978, when the CCP enshrined a new guiding principle of economic development in place of class struggle. Deng had captured the rationale for this new pragmatic shade of socialism many years prior, with the marvellous aphorism, “It doesn’t matter whether it’s a white cat or a black, I think; a cat that catches mice is a good cat.” In other words; outcomes matter, not ideology. The general policy stance was known as ‘Reform and Opening Up’. Owing to persistent food shortages, the agricultural sector was the first beneficiary of the new leadership’s reformist approach. Price controls were relaxed, and farmers were granted the right to keep profits earned from any produce sold in excess of certain quotas. By 1984, when these reforms were completed, agricultural output had soared by 47% (see Zhu 2012 for this an many other useful figures). Buoyed by successes in the agricultural sector, the government expanded market reforms to other industries. Private enterprises quickly ballooned, with employment in these organizations rising from 15% of total employment in 1978 to 39% by 1988. This was the first phase of China’s development; institutional reform led to markets emerging as price-setting and resource-allocating mechanisms, and private enterprise flourished. The process continued through the 1990s; state-owned enterprises were privatised (or their management given more independence), and international trade and investment expanded. In particular, export-focused manufacturing boomed. However, this newfound commercial vibrancy, along with the demands of a growing urban population, required substantial infrastructure upgrades: roads, ports, railways, utilities, housing, schools, hospitals, and so forth. It turned out China was well-suited to the task of ramming through major infrastructure projects, having retained an authoritarian political character despite the government’s liberalising economic reforms. However, this state-sector involvement in the economy inevitably offered opportunities for privileged insiders to exploit political connections for personal gain; ‘rent-seeking’, in economic parlance. China’s enthusiasm for reform stalled and the role of state-led investment became more entrenched with the eruption of the Asian Financial Crisis in 1997-98. To evade the fallout from the crisis, the government supported overall demand by boosting investment spending. Any inefficiencies that may have been creeping into the system as a result of this increasing prominence of the state were buried beneath the surge in trade and foreign investment which followed China’s accession to the World Trade Organization in 2001. Unfortunately, this export-dependent model suffered a blow with the arrival of the next international financial crisis in 2008. Demand dived in the enfeebled, debt-drenched economies of the North Atlantic, and China’s exports cratered. This new credit funded infrastructure projects and ignited a boom in property, with land and dwelling prices and new construction all surging. The consequent stats are ready-made to awe: China produces roughly as much steel as the rest of the combined, accounts for 40% of global copper demand, two-thirds of global seaborne iron ore demand, and apparently produced as much cement in 2011 and 2012 as the US did over the entire course of the 20th Century. Naturally, this surge in construction activity dramatically boosted demand for raw materials, which proved an enormous (albeit temporary) windfall for commodity exporters like Australia. The slump and quick rebound courtesy of Chinese stimulus are apparent in spot prices for iron ore and coal. The peak for iron ore and coal prices in 2011 also happened to be more or less the zenith for the current incarnation of China’s seemingly miraculous growth model; one exemplified by the ascendancy of commodity-intesive investment spending. Since then, the government has been at least nominally committed to a renewed reform effort to rebalance Chinese growth away from an over-reliance on investment and towards consumption demand. However, there were scant signs of genuine policy adjustments until late 2013. Early on in China’s development story, rising investment was a sensible and necessary accompaniment to an expansion in private sector productivity resulting from liberalising reforms. Yet public sector investment over the past decade and a half has increasingly become the primary source of growth, rather than an augmentation of other productive activities. The core argument is simple: if China does not find sources of consumption demand, it will be saddled with endemic overcapacity in a number of industries and face the hangover from years of uneconomical investment. This paper from the IMF goes into detail. The extent of China’s ‘over-investment’ issues remains a matter of debate. For instance, concerns about the economic justifications of the massive high-speed rail network China has constructed in the past few years look to have been overblown. Much of the infrastructure that has been built is no doubt useful and economical. Nevertheless, there are clearly areas of substantial overcapacity in the Chinese economy; for example in steel, cement and coal production, a well as the property market, and this matters greatly for Australia. A successful rebalancing of the Chinese economy almost certainly entails considerably less demand for Australia’s key commodity exports, so any sign that the government is committed to such a path is worthy of our attention. At the Third Plenum meeting last November, just shy of 35 years after a similar conclave agreed upon the groundbreaking reforms that ushered in China’s re-emergence, the CCP produced the most ambitious reform framework in years. Many of the new measures are specifically aimed at shifting wealth away of the state and state-affliated entities, towards the household sector and service industries, and in so doing helping to rebalance the economy after years of excessive investment spending. Some of the most important of these cover land reform, changes to the system of household registration (known as hukou), a new focus on the environment, and a deepening of market forces across the economy. After at least 15 years of ever-greater reliance on commodity-intensive investment spending, the intention is palpable amongst China’s leaders to assert a greater role for household consumption and private enterprise. The immediate outlook for Australian interest rates hinges largely on the resolve of the leadership in China to continue along the path of renewed economic reform. To my mind, the short-term barometer of this resolve is the provision of credit. Credit is tight at present, and the property market is suffering accordingly. The government squeezed through a ‘mini-stimulus’ earlier this year, however the effects of this are already fading, and there appears to be very little appetite for a repeat of ‘big bang’ stimulus measures. That being said, if deteriorating economic conditions see the Chinese government succumb to temptation, revive easy credit and fall back on fixed asset investment, then it is quite possible for iron ore to stage a strong rebound into the Q4 restocking period. In this scenario, the RBA could well fix its gaze firmly on the housing market, decide that the exuberance needs restraining, and hike interest rates next. This is the consensus view from all the surveys of market economists I have seen. If the terms of trade stabilise, then in the short-term low interest rates may well prove sufficiently stimulatory to warrant a hike. If, instead, the Chinese government refrains from rescuing the property market with easy money, and stands firm in its commitment to the latest round of market reforms, we are likely to see Australia’s terms of trade continue to decline sharply (notwithstanding a light rally in iron ore later in the year). The direct impact of this hastening decline on the average Australian household is not especially great, though WA will feel the full brunt of it. However, it will undoubtedly damage commonwealth revenues. That means a deteriorating federal budget and the likelihood of more scary noises about austere savings measures, which, as we saw earlier this year, households do not like. I find it highly unlikely that the RBA will hike rates in the midst of a terms of trade rout such as we are witnessing today. This will leave the cash rate on hold through until next year when the impact of lower mining investment, and the accompanying job losses, begin to appear more acutely. If the Chinese government holds the line on reform and sanity prevails on credit growth, then the Australian housing sector, which I will examine in the next post, will need to muster an almighty charge to overwhelm the effects of the terms of trade bust and declining business investment in 2015, and thus compel the RBA to hike. Not impossible, but an increasingly shaky proposition as the economy weakens. This entry was posted in Uncategorized on September 3, 2014 by MJV.